Billions of years ago, the moon may have had a magnetic field stronger than Earth's is now, scientists say. The moon once had a magnetic heart, which helped the moon generate a magnetic field stronger than Earth's is now, researchers say. However, many mysteries remain about the magnetic field of the moon, such as what powered it and when it ended, the scientists added. But scientists were uncertain whether the moon generated a magnetic field the same way Earth does, or if the magnetic fields seen on the moon were instead produced by outside forces. For instance, cosmic impacts on the moon could have sparked super-heated plasma that generated strong, brief magnetic fields, explaining the magnetized rocks the astronauts discovered. In the past six years or so, however, a new generation of scientific techniques and computer simulations has now made a strong case that the moon may have had a magnetic core like Earth's. Magnetic fields are generated by electric currents. "We think planets generate magnetic fields by moving electrically conducting fluids inside them," said study co-author Benjamin Weiss, a planetary scientist at MIT. Flowing metal in Earth's core makes the heart of the planet a dynamo — a generator of electrical current — and this dynamo generates Earth's magnetic field. If the moon had a dynamo that generated a magnetic field, that could yield key insights into its hidden inner structure. "The defining question of lunar science for more than four decades, even before the Apollo missions, is to what extent is the moon an unmelted primordial body like many asteroids, as opposed to a melted evolved body with a multilayered structure, which can have a metallic core with a magnetic field," Weiss told Space.com. Recent scans of magnetized lunar rocks that show no evidence of effects from cosmic impacts now provide strong evidence that the moon had a magnetic field 4.25 billion to 3.56 billion years ago, at least 1 billion years after the moon formed. "Earth's magnetic field is currently 50 microteslas in strength," Weiss said. "The early moon may have had a magnetic field that was bigger, maybe up to more than 70 microteslas." It remains uncertain what might have powered this surprisingly intense lunar magnetic field. "It's hard to understand how the moon's magnetic field could be as strong as it seemed given how the moon has a very small core," Weiss said. "The moon's core is maybe one-fifth to one-seventh the radius of the moon, while Earth's core is maybe one-half the planetary radius. This means the surface of the moon is much farther away from its core than you see with Earth. Since magnetic fields fall rapidly in strength with distance, it's hard to understand how the moon could have had a magnetic field that was that strong all the way to its surface." All known dynamos of planets are generally thought to be powered by convection, the roiling of fluids due to heat. 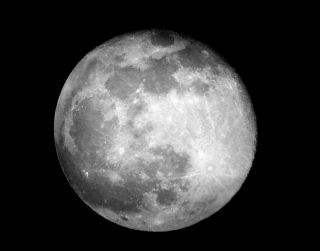 Given the size of the moon — only about a quarter of Earth's diameter — the moon should have cooled relatively quickly. So a lunar dynamo powered solely by convection should have persisted only for a few hundred million years at most, until about 4.1 billion years ago. However, new models suggest that the moon's innards may have been less viscous than thought, and that radioactive material inside the moon could have kept it warmer. These factors may have enabled a convection-powered lunar dynamo to last until perhaps 3.5 billion or 3.4 billion years ago. There are other more exotic mechanisms that scientists have suggested could have powered the lunar dynamo. "One involves smacking the moon obliquely with large impacts from asteroids maybe a bunch of times," Weiss said. "You could also use the fact that the moon's spin wobbles over time, which is called precession, and it wobbled a lot more intensely in the past when it was closer to Earth, and that could also instill motion to power a dynamo. Both these mechanisms are not known in any planetary body today, and would represent new ways of generating magnetic fields." Another mechanism could be the main power source for Earth's dynamo, which is crystallization of its core, which causes lighter elements such as sulfur to float from the bottom to the top, stirring matter up. "This could have played an important role in sustaining the lunar dynamo," Weiss said. Oddly, the lunar magnetic field did not disappear completely after 3.5 billion years ago, but persisted, albeit at least 10 times weaker, until at least about 3.2 billion years ago. "Maybe there were multiple dynamo mechanisms operating at different times in lunar history — one mechanism during the moon's early period when the magnetic field was really strong, like precession, and when that shut off, another weaker mechanism took over for a while, like core crystallization," Weiss said. Certain models suggest the lunar dynamo could spontaneously transition from strong to weak, he added. Much remains unknown about the moon's magnetic field. "We still don't know when the lunar dynamo turned off," Weiss said. "There's evidence it lasted until at least 3.3 billion years ago, and perhaps as long as 1.3 billion years ago, really pushing the limits of what we know can power the lunar dynamo." Weiss and his colleague Sonia Tikoo reported the latest findings on the lunar dynamo online today (Dec. 4) in the journal Science.